This article was written By Josh Samford on 04 Jul 2013, and is filed under Reviews. Josh Samford, co-host of the VCinema podcast, web wonder boy, graphics guru, and blog contributor, lived a much more traditional life in south-eastern Louisiana. Fighting off vicious man-eating crocodiles and venomous snakes on a daily basis when he ventured out into the sunlight, he spent the better part of his upbringing in front of the picture box. This is where he learned and began his obsession with horror cinema. A diet of Friday the 13th and A Nightmare on Elm Street during his formative years would help establish that love for horror, until his introduction to the internet where a free-reign circus of cinematic delights would then be open for his exploration. Where in Louisiana the name Lucio Fulci is unknown and foreign, through the internet Josh was able to discover an infinite number of obscure but brilliant filmmakers to quench his thirst for knowledge. Josh has been the head-writer and owner of his website Varied Celluloid since 2003, where he writes on a weekly/biweekly basis about various genre films. With the title “Drug War,” readers wouldn’t be wrong to imagine that Hong Kong’s critically acclaimed director Johnnie To might be delving heavily into cinematic darkness. However, just how far the movie goes might prove to be a surprise, even for the most jaded Hong Kong film fan. Drugs are often a taboo subject in Hong Kong cinema, and many of the films that deal with them are often exploitative and over-the-top in nature. 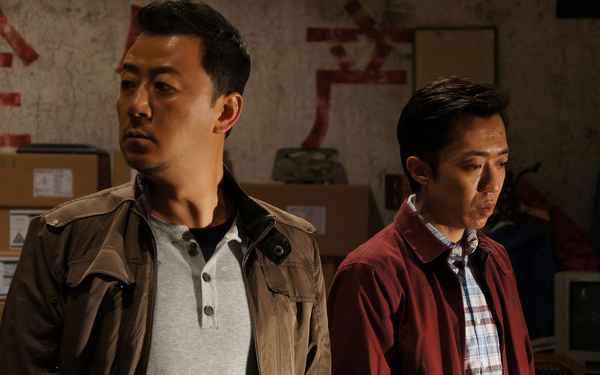 Drug War, as the title implies, is a story about the drug trade in China, and the film doesn’t pull any punches. 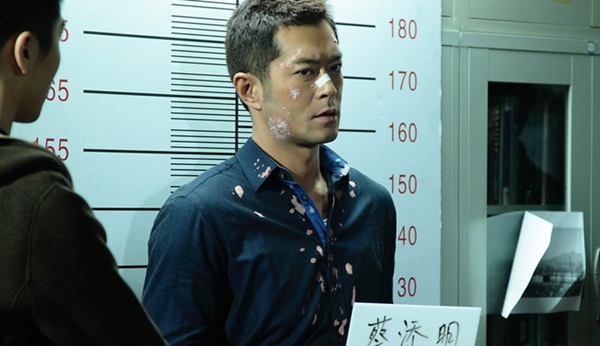 The plot follows two men, drug peddler Timmy Choi (Louis Koo) and Police Captain Zhang Lei (Sun Honglei). During the film’s introduction, we discover Timmy after a lab accident which has left him very badly injured. He is eventually picked up by Captain Zhang, and after only a short amount of time, Timmy is ready to talk. He’s willing to give up just about everyone involved in the world of narcotics. In order to shorten his sentence, Timmy offers to point the Captain to notorious drug smuggler Bill Li. This crime lord is notoriously well-hidden and nearly a myth within the drug trade. Of course, the Captain is interested, so taking Timmy up on his offer, he heads undercover to find hard evidence that will put Bill Li away and sink the amphetamines market in China. The first thing that struck me about Drug War was its rather rebellious nature. Johnnie To’s first-ever mainland production, the film defies much of what one might expect from a mainland title. Drug display and use would be chief among things to avoid from the eyes of the Chinese censorship board, but they entirely comprise Johnnie To and Wai ka Fai’s script. 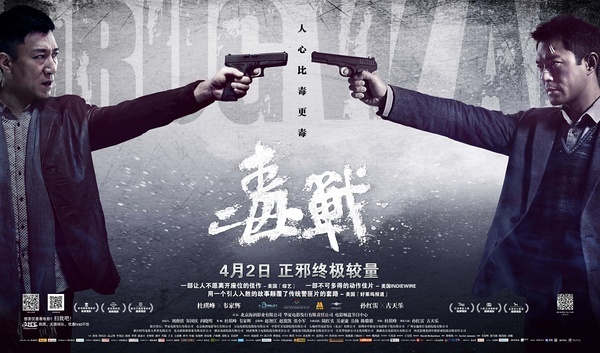 Added to this, the two writers craft a bleak and gritty story that inevitably leads to a couple of very bloody and violent sequences that could become legendary in Johnnie To’s filmography. Indeed, everything about the film seems antithetical to what I have seen from modern Chinese cinema. This is not a film of traditional values. There is no white hat/black hat mentality to be found in Drug War; the police are often shown to be even more hardened than the villains that they are chasing. Complacency, empty stares, and a lack of remorse, this is the bright and shining world of law enforcement within Drug War. How the movie managed to get past the censors without the tiniest trace of flag waving patriotism is quite a feat. Despite the bleak undertones of consistent professionalism and heartless vigilance, there is a thudding rhythm found in Drug War. This rhythm isn’t unfamiliar within To’s work; it’s also evident in PTU and the Election series. This beat is developed through a quick progressive series of cuts and scenes that divvy out parcels of information in quick secession. With each quick scene, the story unravels a little bit more. In the case of Drug War, the audience may not be growing to intimately know the “heroes,” we do get a very gritty vision of their job. Ultimately, if the film has a weakness, it comes from this lack of a human element within the film. Similar to the work of Michael Mann, this is a film that deals in cold realities with very little sentiment along the way. Structurally, the film is set up in an interesting manner. In this day and age, when it seems the majority of new Asian films clock in at two to two and a half hours, it is nice to see a feature with this type of scope managing to clock in under that much. However, this short running time may lead to a narrative that seems too condensed. Like many other great crime films, Drug War is heavily dependent on exposition and plot twists. However, along with that, there is a fairly large cast of characters who each need their own time to develop. In the end, the film sacrifices character-driven drama for something that is inherently plot-driven. The character of Timmie is perhaps the only character in the movie who provides some believability, but even he remains a bit of an enigma. Is he a coward, does he have ulterior motives? These are questions that remain throughout the majority of the film. In the case of our “hero,” Captain Zhang Lei, he is defined by his job. In the earlier scenes of the film, he shows very little emotion, even during the harshest moments of his job. Complete indifference typically adorns his and his officers faces, even while they force a sobbing woman to embarrass herself and defecate into a bowl, all because they assume she may be a mule for amphetamines. This is the war on drugs as shown by Johnnie To, and it is all business. The movie occasionally enters into over-the-top action movie heroics, something that seems out of character for the director who gave the world The Mission and Running Out of Time, but there’s no denying that it works. Aside from the action, the film presents characters who have little presence other than strong gimmicks, as is the case with the two deaf/mute brothers who aren’t nearly as soft as they at first seem. The violence is also a bit ramped up for the average Johnny To production. While nowhere near the squib-crazy world of John Woo, the final thirty minutes of Drug Trade may come as a surprise to some Johnnie To fans. Without spoiling a thing, I will say that viewers should expect some fairly gritty urban violence. Ultimately, Drug War contains filmic elements expected of Johnnie To, but also delves into some defiant and new territories. Although not all viewers will become absorbed with its bleak world of cops and dealers, few will deny how potent and intense the drama is. If you’re in New York for the NYAFF, do yourself a favor and check out Drug War. It’s a visceral experience that isn’t to be missed. Drug War is screening at the Walter Reade Theater on Friday, July 5th at 7:45pm as part of this year’s New York Asian Film Festival. For more information and tickets, go here.